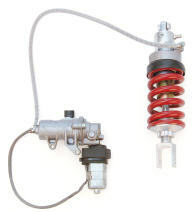 The first option is to have the stock shock rebuilt with a Gold Valve Conversion Kit and resprung with a RT Hi-Performance Spring. The second option is a complete G3-S Custom Series Shock that includes a Rebound Adjuster. The revised damping and spring rate will increase bottoming resistance while improving comfort. Both options are built to the rider's preference and are guaranteed. The first option improves the stock shock's performance by installing a Gold Valve Conversion Kit. With a slight modification, the stock "non-rebuildable" shock can be fully rebuildable. With this option you get a custom setup Gold Valve Conversion Kit and the correct spring rate for your riding style and comfort. Guaranteed! Gold Valve Conversion sells for $599.99 with Preload Adjuster upgrade included! 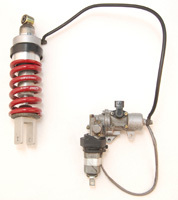 The second option is a complete G3-S Custom Shock. These shocks include an external Rebound Adjuster and come valved and sprung specifically for the rider. Guaranteed! G3-S Shocks are made in the USA and guaranteed! All GL1800 shock work is performed exclusively at Race Tech. Because we upgrade and re-use the stock Electric Hydraulic Preload Adjuster each shock is subject to a $200 core charge if a stock GL1800 replacement shock isn't received prior to the invoice date. All cores must be received by Race Tech within 30 days from the date of invoice. 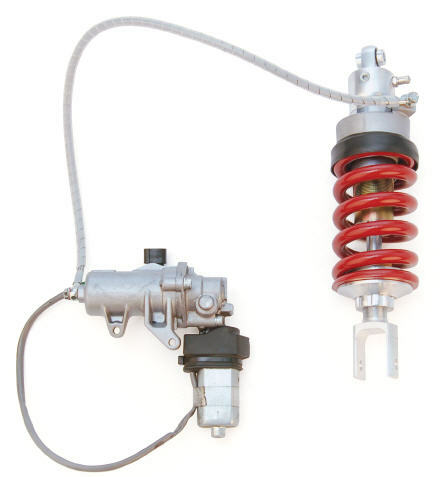 The shock absorber must be in rebuildable condition with no physical damage. The Electric Hydraulic Preload unit must function correctly; motor must work generating preload. Leaking oil seal is OK. Damaged hose is OK. Core exchange must be received with in 30 days of invoice date.